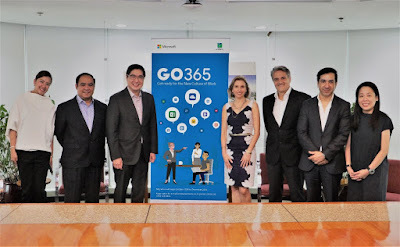 With a vision to become the leading digital conglomerate in the Philippines, JG Summit Holdings Inc. aims to achieve this goal through a digital transformation journey that will embed digitalization in its core business strategies to meet the evolving needs and lifestyle not just of its customers, but also of its employees. “Our vision is to be the leading digital conglomerate in the Philippines. To achieve that goal, multiple groups within the JG Summit Business Units, Subsidiaries, and Affiliates have been working behind the scenes to bring about this transformation,” said JG Summit President and CEO Lance Y. Gokongwei. Among the initiatives will be to upgrade the employee experience across the entire conglomerate through the use of Microsoft Office 365 and the cloud platform. JG Summit is transitioning from on-premise systems to Microsoft’s cloud services. Office 365 is a set of Microsoft applications that allows users belonging to the same network to store files and share information. Compared to earlier versions of Microsoft applications, Office 365 uses the cloud platform, which offers agility, greater efficiency and security benefits. JG Summit’s move to the cloud platform will further enable its employees to transform their environment into a digital workplace. With this project, the conglomerate envisions a New Culture of Work where employees will be introduced to the Modern Digital Workplace which will empower people across the organization to achieve more by enabling better communication, collaboration, and sharing of information from computers to mobile phones in a single cohesive platform. The first step is to migrate everyone away from current e-mail platform and put everyone up unto the cloud platform accessible from anywhere in the world and enable collaboration on any device. JG Summit is one of the largest and most diversified Filipino conglomerates, engaged primarily in businesses that serve a growing middle class with rising disposable incomes in the Philippines, Southeast Asia, and Australasia. These businesses include branded snack foods and beverages, commodities, agro-industrial businesses, air transportation, banking, real estate, and petrochemicals.